More spirited sailing awaits you in the Leeward Islands which include St. Maarten, Anguilla, St. Barthelemy (St. Barths), Saba, St. Eustatius, St. Kitts, Nevis, Antigua & Barbuda, Guadeloupe, The Saints, and Dominica. A wonderful week can be spent cruising the “Renaissance Islands” of St. Maarten, Anguilla and St. Barths. Visit the Dutch side of St. Maarten for duty-free shopping or a bit of gambling, then sail to the French side for chic boutiques along the quay in Marigot. Grand Case is the culinary Capital of the Caribbean, or sail up to Orient Beach where you can lose your tan lines! Anguilla has miles of white sandy beaches and 5-star resorts. After a relaxing day, this little island comes alive at night. St. Barths is one of our favorites. Fabulous beaches, outstanding dining and shopping. You don’t have to be rich & famous to enjoy this chic destination. Rent a motor scooter or ATV and tour the island, or stop into Le Select for a Cheeseburger in Paradise. You can dance until dawn, or listen to live music in a waterfront jazz cafe. 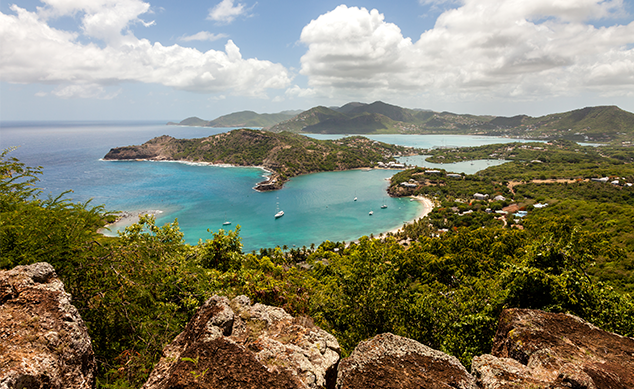 Antigua is rich in history. We recommend boarding your yacht in historic English Harbour. Enjoy circumnavigating the island with a 25 mile sail up to unspoiled Barbuda for superb snorkeling and a visit to the frigate bird rookery. Antigua is THE place to see some of the most beautiful yachts in the World, especially during the Classic Yacht Regatta in the Spring. Immediately following the Regatta is Antigua Race Week. Even if you don’t race, it’s a fabulous week for spectating and enjoying the parties. The lush island of Dominica is a mecca for hikers and eco tourism. With one river for every day of the year, Dominica features dramatic waterfalls, 8 volcanoes, boiling lakes, natural hot springs and spectacular scenery.